Colorado House Speaker KC Becker addresses lawmakers Friday morning as her son, Leo, applauds her speech. Her pledge to pursue what is known as a “red flag” law was met with a standing ovation from Democratic lawmakers in the House. Previous efforts to pass such legislation, which allows guns to be taken away from individuals who pose a danger to themselves or others, has been blocked by Republicans. 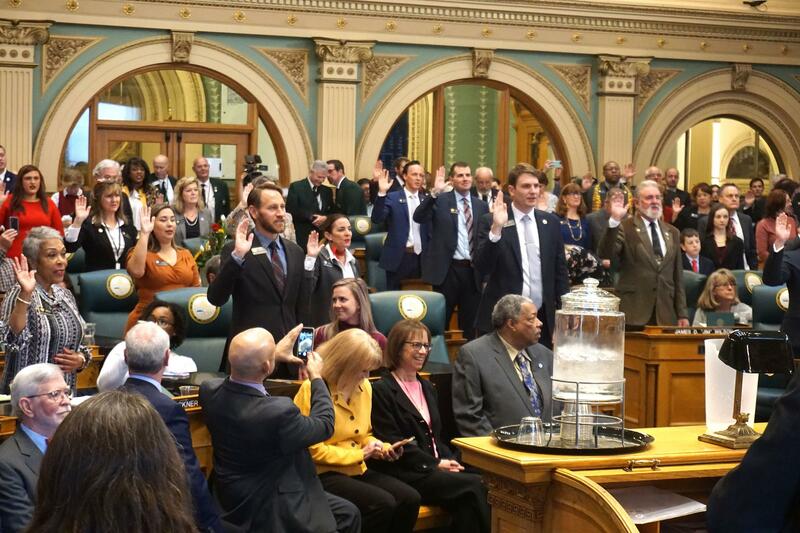 Lawmakers also gave standing ovations to Brianna Titone, D-Arvada, the state’s first transgender lawmaker, and to a call to invest more money in education. The Democrats officially control both chambers of the statehouse. They will also control the governor’s office and every other major office in the state for the first time since 1936. Republicans spent the day urging their colleagues in the majority not to overreach with their own power. Senate Minority Leader Chris Holbert, R-Parker, described his party’s new political reality. But Holbert has also pledged to work with Democrats in a bipartisan fashion. For example, he said he’ll work with the Democratic leaders this session to improve the way in which harassment complaints are handled at the Capitol. Such complaints dominated the headlines last session and even led to the expulsion of a lawmaker. The legislature is now poised to debate several proposals that could have a great impact on Coloradans around the state. State Representatives take the oath of office Friday morning at the State Capitol. Democrats have control of both chambers during the session. When the legislators arrived at the Capitol on Friday morning, they were greeted by protestors who are pushing for a temporary halt to all new oil and gas drilling in the state. So far, lawmakers in both parties have expressed opposition to adopting such a moratorium. There have also been no specific legislative proposals revealed to push oil and gas operations further from schools and homes after voters rejected a proposal to increase the setbacks to 2,500 feet. But in her speech, Becker said more needed to be done to protect homes and schools from the drilling operations. Health care is also poised to be a big topic this session. One of the first House bills introduced later Friday afternoon was a proposal from Rep. Dylan Roberts, D-Avon, that aims to create a state backed, public insurance option. Other sponsors of the bill include Sen. Kerry Donovan, D-Vail, and Republican Rep. Marc Catlin of Montrose. The lawmakers hope to bring down the rising cost of health insurance in the state’s mountain and rural communities, where premiums can be much higher than similar plans offered on the Front Range. Lawmakers will welcome their new governor, Jared Polis, on Tuesday morning. Polis will deliver his State of the State address on Thursday.